If you are ever near Floyd, VA, be sure to put this hike on your to do list. There is a heart pounding climb at the beginning of the hike, some gentle hiking through meadows on top of the ridge and then mostly down for the last 4.0 miles. You will see an old Appalachian Trail shelter, chimney of an old homestead and then the Austin House beside Rock Castle Creek. There are multiple places to start this hike along the Blue Ridge Parkway, but we recommend starting at the convergence of Rock Castle Creek and Little Rock Castle Creek in the gorge. Basecamp at the primitive camping area 0.25 miles upstream on Rock Castle Creek on fire road, and do it as a day hike. Mile 0.0 – From the parking area cross barrier and bridge, continue straight on fire road and in 0.10 miles make a sharp turn to the right on to the green-blazed Rock Castle Gorge Trail. Mile 0.5 – The trail starts to become much steeper, gaining almost 1100’ in 1.0 miles. Mile 1.5 – The tough part of the trail is over, in 0.3 miles cross two bridges. Mile 1.8 – Cross two bridges. Mile 2.8 – You will climb the first of four fence stiles and into a pasture. The last stile will be around the 7.0 mile mark. Be prepared to dodge some cows, a huge bull and of course their cow patties over the next mile. As the Blue Ridge Parkway becomes visible, you will see the entrance to the Rocky Knob Campground and Visitor Center on your right. Follow short trail posts with arrows through the pasture, the trail hugs the pasture close to the Blue Ridge Parkway for the most part. There are great views over the next 4 miles. Mile 3.4 – Tree coming out of rock, we stopped here for lunch. Mile 3.7 – Reach Saddle Overlook, in 0.1 miles bear left at fork intersection. The trail is evident but there are no blazes as you go over Rocky Knob. Mile 4.0 – Former Appalachian Trail Shelter, the AT was relocated to the west in the 1950’s. Continue on other side of shelter by the chimney following ridge line as other unmarked trails go right towards the parkway. There are a couple of other good viewing areas just after the shelter on your left. The top of the incline is Rocky Knob. Green blazes will start again in about a 0.5 miles. Mile 4.4 – T-intersection, bear left onto Rocky Knob Trail. Mile 4.8 – Rock Castle Gorge Overlook. Mile 5.1 – 12 O'clock Knob Overlook. Comfort Station, Picnic Area and bathroom is just across the Parkway. Trail is now blazed Green and Blue. Trails over the next mile will come in from the right, stay left. Mile 5.7 – Cross a fence stile into another meadow and bolder field. Mile 6.1 – Black Ridge Trail intersection, stay left on Green-blazed Rock Castle Gorge Trail. You are now in Grassy Knoll. Mile 6.6 – Leave Grassy Knoll, go through a fence stile/gate. What goes up must go down, and you will be going down the rest of the way, and the first few miles will be steep. Mile 7.7 – Go through boulders of bare rocks. Mile 8.0 – Old homestead chimney ruins on left. Just after the chimney you will cross the first of four metal bridges. Mile 8.1 – Intersection with fire road, bear left and follow Rock Castle Creek downstream. Mile 9.2 – Austin House, privately owned, built 1916. Also there is an old barn just past the house. Mile 10.4 – Primitive camp site. 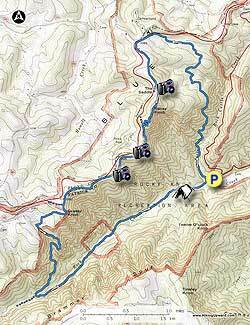 Permit required from Visitor Center or Rocky Knob Campground on the Parkway. You are not allowed to camp anywhere else on this trail besides this primitive camp site. Mile 10.7 – Return to the parking area. This was one of the most strenuous hikes we have ever completed (and we've hiked in deserts, canyons, and more). Mileage is off - it's well past 10.9 miles as stated on the map and probably closer to 15 miles, total. Took us about 8 hours with plenty of rests along the way. Gorgeous waterfalls, varying terrain, meadows, and more made it enjoyable. Pack plenty of water and leave a lot of time. Awesome hike! Arrived to start the hike later than anticipated around 2:45pm from the twelve o'clock knob overlook and started the hike clockwise... great start considering everyone recommends the opposite direction. The first mile was spent taking in some seriously spectacular views as we passed rock castle gorge overlook, rocky knob, and saddle overlook and even from the first cow pasture! After that you get a feeling of being deeply alone in the woods which is just incredible and exactly what a long, hard hike like this should deliver. There's about a mile of traversing a rocky descent before you arrive at the bottom and meet up with the creek. Then, you're on the fire road. This serves as an excellent place to make up some time which may have been lost enjoying the sights at the overlooks. These 2.8 miles have a slow and steady incline and are wide and easy to traverse-- also another treat! Along this part I did see a black bear and various prints, so beware. After the fire road we began our ascent once again out of the gorge. this was moderate at worst and to me what made it difficult was just the sheer distance preceding it, but it was definitely manageable. At the top of the 1.5 mile 900' ev section you will arrive at another cow pasture. If you have a dog with you please use caution because me and my dog almost got mauled by some angry cows as we interrupted their feeding along the trail. They were not fans of us stepping on their grass before they got to eat it :( from there its easy and your only about 1.5 miles from the twelve o'clock knob parking area again! All in all this was a great hike with excellent views and a challenging but rewarding and manageable terrain. Great for training for an AT thru hike. Make sure to bring plenty of water. Me and my dog went through almost 5 liters on a 80 degree day. There is the creek so you don't have to bring it all with you as long as you have a water treatment system with you (yay for Sawyer filters!) I loved this hike and its a rare gem. :) Hike on friends!!!! Great Hike and even better workout! We started around 8am to beat the heat, did the hike counterclockwise as recommended and made it in just a little over 5 hours. Remember to take plenty of water and have that extra bottle. Most of the hike was in the wooded area and provided good shade for the hike. the creeks provided ice cold water to dip the hat in to cool off. Stopped a little over half way for lunch. Hiking stick or poles are a must due to the steep areas and slick rocks. Remember its a gorge so if you hike down, you have to hike back up, be prepared for some tough but rewarding hiking with some awesome views. Planning on doing this again in the fall or Winter. The Rock Castle Gorge was a great hike. My wife and I arrived around 9:45AM at the Twelve O'Clock Knob Overlook. We left from there and followed the loop in the South direction. I was a great hike and it had everything, we enjoyed the Rock Castle Creek at the bottom of the gorge. The climb up to the Rock Castle Overlook is tough. Water and food should be considered. The hike is 12.9 miles and we made it in 4:15. 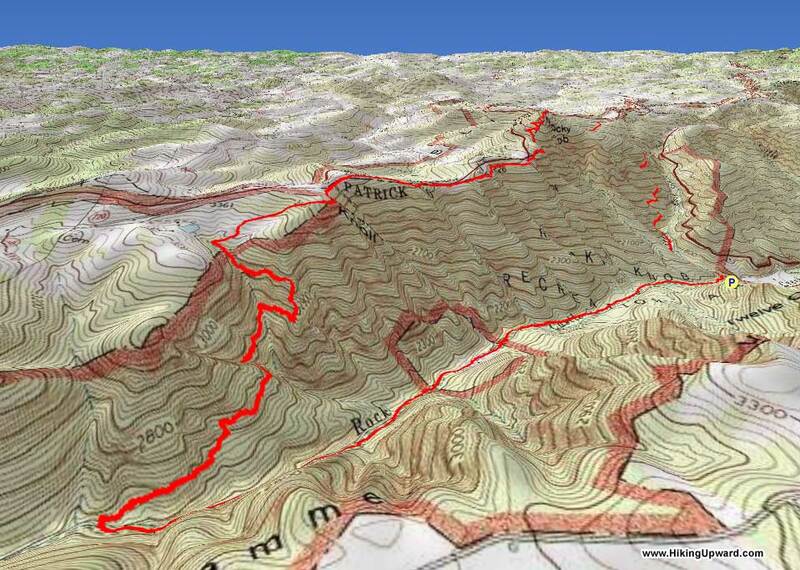 We used Strava to map the hike.